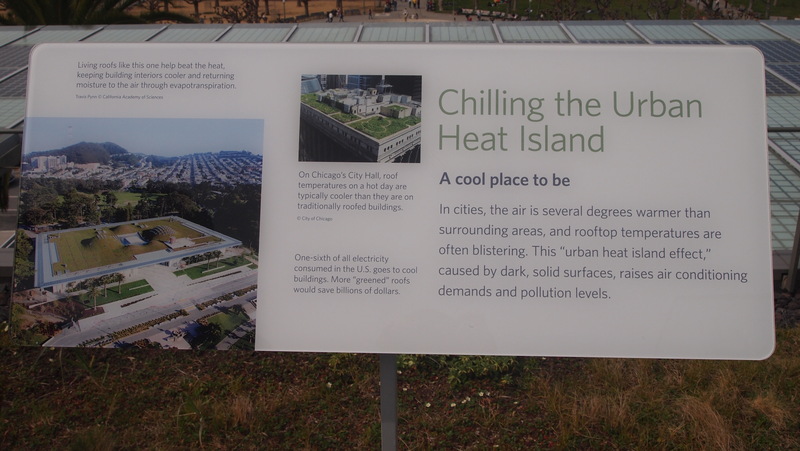 When visiting the California Academy of Sciences in San Francisco last weekend, we learned about something called the “Heat Island Effect.” This refers to the rise in temperature in densely populated areas, typically cities with lots of buildings and little green space. According to the U.S. EPA, the annual mean air temperature in cities with 1+ million people can be anywhere from 1.8-5.4°F warmer than its surroundings. In the sun of summer, roof and pavement surfaces can be 50-90°F hotter than the air temperatures. Imagine how miserable this temperature increase can feel if you are stuck in the middle of a concrete jungle, with no trees or grass to cool you down. Increased Energy Consumption — According to a placard atop the living roof at the California Academy of Sciences, one sixth of all electricity used in the U.S. goes to cooling buildings. As rooftop temperatures increase in urban areas, the buildings inside require additional air conditioning to keep the inside temperatures comfortable. ONE SIXTH….that’s a lot of energy! Impaired Water Quality — Hotter surfaces in the city increased the temperature of stormwater runoff. According to the EPA, tests have shown that pavements reaching 100°F can increase the temperature of 70° rainwater into 95° runoff as it drains into the sewers, raising sewer water temperatures in the process. This then increases the temperatures of streams, rivers, etc. as runoff works its way back into our groundwater supply. As we’ve seen through many studies around global warming, increased water temperature around the globe can lead to sea level rise and a disruption in the aquatic ecosystems around the planet. I’m sure there are many more problems, but I like focusing on solutions. How about building a Living Roof! 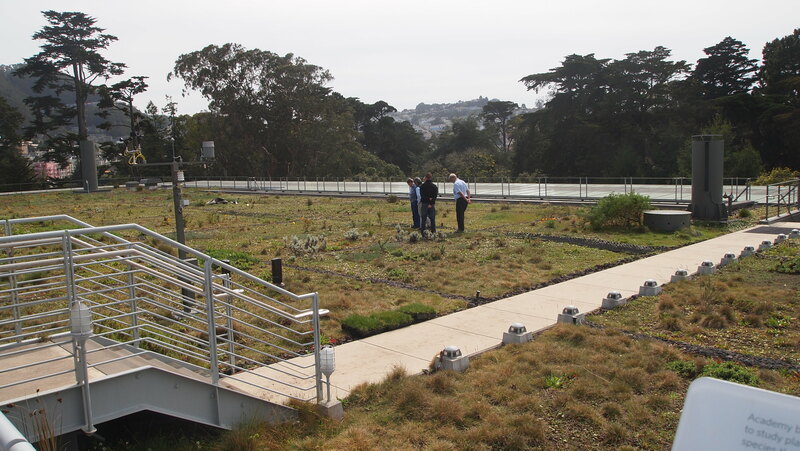 At the Academy of Sciences, we visited the Living Roof on top of the building. This roof is covered in grass, plants, rain filtration systems….you name it. According to another placard at the Academy, living roofs absorb most of their rainfall. In fact, the building at the Academy retains 98% of its rainwater, which saves over 13 million liters from flowing into the city’s stormwater/sewer system. Living roofs also keep buildings cooler, reducing the need for air conditioning, and thus, reducing the release of resulting air pollutants. I also think the incorporation of rooftop gardens or living roofs can provide a little green paradise in the middle of the big city, all without giving up valuable real estate. It’s basically like taking a backyard garden, and simply building it on the roof! Whether a residential or commercial building, a green space on the roof can provide tenants a little oasis, while reducing the building’s energy consumption and resulting pollution, all at the same time. The information in this post was gathered through the following sources: U.S. EPA website, www.epa.gov/hiri, and a visit to the California Academy of Sciences rooftop observation terrace. 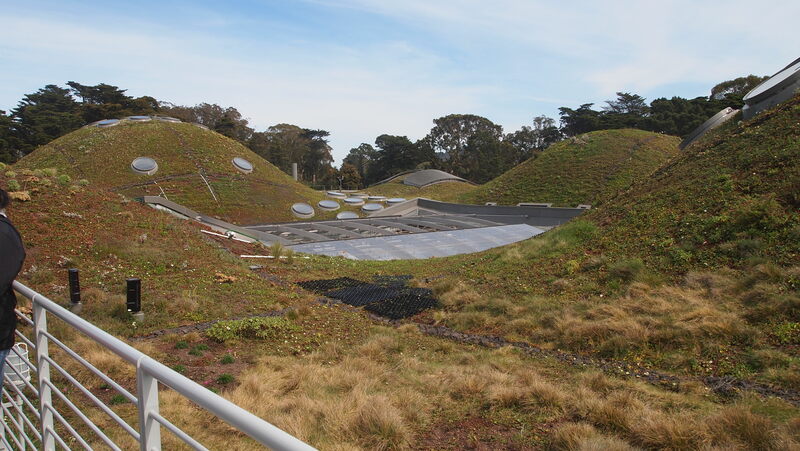 You can learn more about the Academy’s Living Roof at http://www.calacademy.org/academy/building/the_living_roof/. This entry was posted in Environment and tagged California Academy of Sciences, global warming, green buildings, Heat Island Effect, heat island mitigation, impacts of heat island effect, Living Roof, Meg McCollister, rooftop gardens, Shifting the Balance, why you should consider building a living roof. Bookmark the permalink.